Tag Archive | "Silver Hatchetfish (Gasteropelecus levis)"
Silver Hatchetfish (Gasteropelecus levis) are found only in open water of larger igarapés, streams, and floodplain lakes of the lower Amazon river basin and the lower sections of the rios Tocantins and Guamá in the state of Pará, Brazi. Because of their heavily keeled body shape, all Gasteropelecids are commonly referred to by tropical fish keeping enthusiasts as “freshwater hatchetfishes”. Their laterally compressed bodies have evolved to possess an enlarged, heavily muscled, pectoral girdle (protruding belly) which resembles the head of a hatchet, hence it’s common name. 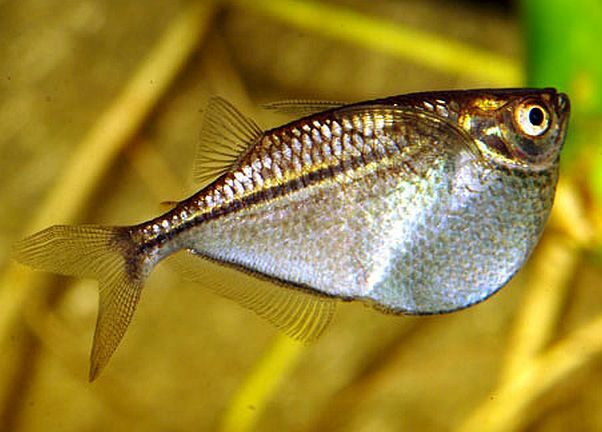 Silver Hatchetfish are relatively small and have black and gold lines running along their sides. Females are noticeably rounder bodied than males, especially when full of eggs. The Silver Hatchetfish (Gasteropelecus levis) is one of three species of the genus Gasteropelecus. Gasteropelecus sternicla and Gasteropelecus maculatus comprise the other two, both of which are often kept in an aquarium environment. To add to the confusion with the name “Silver Hatchetfish“, the Common Hatchetfish (Gasteropelecus sternicla) also called the River Hatchetfish is also known to tropical fish keeping enthusiasts as the Silver Hatchetfish. Unfortunately the name “Silver Hatchetfish” is somewhat of a misnomer. There are a couple of other species also known by this common name. Gasteropelecus levis and Thoracocharax securis (aka the Greater Hatchetfish) are also commonly known in the aquarium trade as Silver Hatchetfish. Although all hatchetfish are similar in appearance, they differ somewhat in size. Both of the Gasteropelecus species are smaller in size. In the wild, G. levis grows to about 1″ in size and G. sternicla maxes out at about 1 1/2″ but in an aquarium environment, they can grow up to 3 1/2″. The Greater Hatchetfish (Thoracocharax securis) grows to about 3 1/2″ in length and lacks the pronounced black horizontal line that the other species have. Most tropical fish keeping shops routinely sell the Common Hatchetfish as the Silver Hatchetfish. The Silver Hatchetfish (Gasteropelecus levis) is a shy, peaceful, and somewhat nervous shoaling species that spend most of their time close to, or just under the water surface where they feed primarily on terrestrial insects, worms, and small crustaceans. Like other freshwater hatchetfishes, the Silver Hatchetfish is known for its ability to leap from the surface of the water and glide for distances of several yards. The behavior is used to catch flying insects and escape from potential predators. Silver Hatchetfish should be housed with at least 6 or more of their own kind in an aquarium having a lot of surface water area. Because of their skittishness and predilection to jumping, they need a densely planted tank with floating plants and a moderate amount of current. The decor for the rest of the tank is not especially critical but they do well in heavily planted Amazon biotope setups with a sandy substrate, driftwood roots, and some leaf litter on the bottom of the tank. A tightly fitting tank cover is critical for this species. In a community tank, Silver Hatchetfish should not be housed with boisterous species. Peaceful species such as tetras, bottom feeding cichlids (Geophagus or Satanoperca sp.) and catfish such as Corydoras or Loricariids make acceptable tankmates. Not much is known about the breeding habits of Silver Hatchetfish however, they probably breed in a similar fashion to Marbled Hatchetfish (Carnegiella strigata). and Daphnia . They should be fed small portions several times a day. 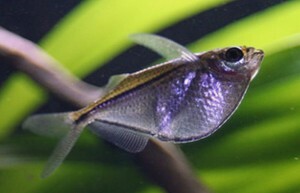 Silver Hatchetfish are commonly available in most tropical fish keeping shops at a size of 3/4″-1″ in length.